We have a progressive extremely efficient business model. There's nothing discount about it. We return money to our clients through our highly efficient systems of operation. Here's a typical assessment of a property for a client. This one closed in January. 'First I would say that the home looks stunning from the pictures and the floorplan - well thought out and tastefully designed. I took a look at DOB, DOF, and at some other recent sales to come up with an initial overview. DOB - This is my initial main concern as I do not see a current C of O for a single family home (have they told you they have it?). There appears to be open items that remain for sign off before the job is complete (see attached). It is of course very possible the DOB page is not current, but from what I see they still have a ways to go before the home can receive it's C of O (plus Landmarks sign-off). As it relates to a purchase you would want to have your attorney ensure that contract-wise the seller/developer were responsible for taking care of all of the open items and delivering a completed home as it pertains to the city. DOF/taxes - The Dept of Finance page is showing the building is currently recognized as a one family and is being taxed as such - so there is some contradiction with DOB (either DOB is not up to date or the building could be sufficiently complete for tax purposes). The taxes on DOF match the listing ($58,439/yr - $4869/mo). I did look back at a tax bill from 2009 before the house sold and any permits were filed and the annual taxes were around $31,000. The current taxes do seem like they could be a natural progression rather than a jump up based on the alteration of building type - will have to investigate further so I cannot say for sure. You would definitely want your attorney to review the tax scenario during potential due diligence as well. Square footage - I calculated on my own based on the floorpan and outside building dimensions and the 8505 ft2 listed is fairly accurate if you include the basement. Generally we might value basement square footage as half but given the level of the finishes and the usability of the space I can see counting as full here. Again the CofO issue stands out the most to me and would require clarification from the agents. Open House Survey : These Numbers are No Bueno! Here are the numbers from last weekend. We received 147 responses, better than the weekend prior, but far from desired 10% goals. 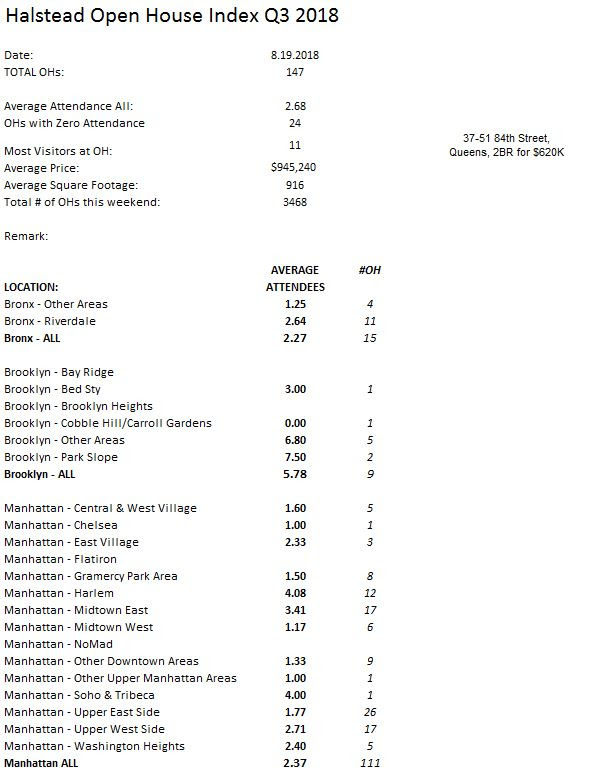 There were 3468 open houses scheduled in NYC for last Sunday, according to StreetEasy. · Manhattan slipped again, this time to 2.37 average per open house. Not once since July 1 was the Manhattan average above 3. Harlem (4.08) and Midtown East (3.41) were somewhat busy and above the average. UWS (2.71) slightly above the average and UES was VERY slow! Just 1.77 per open house. · Brooklyn improved a bit to 5.78, but we are still suffering from too few data points from Brooklyn. Just 9 open houses received. Park Slope and Other Areas were busy. · The Bronx was slow with just 2.27 per open house and solid 15 open houses submitted. · Queens was similar to last weekend with 3.50 per open house. We need more brokers to participate! · Size – most traffic at Multi-Unit buildings, Townhouses and 5BRs, but beware of low sample sizes. At “normal” apartments, the busiest were 2BR open houses with 2.89 on average. · Price – Under $500K category was the only to break 3 attendees on average. Actually 3M+ category had 4 on average, but with just two open houses submitted. · Just 37% premium for the traffic at first open house. I do not think that second half of August is a good time to put your exclusives on the market. I heard from a few of you commenting that many agents are away and some have placed their property in TOM status, because how slow the August was, with hope and message that after Labor Day we will see more properties coming to the market and stronger participation in this survey. Any comments? I wanted to share with you my very unscientific attempt to quantify the number of buyers that were out looking last Sunday. Early this year, I polled Halstead agents and brokers and asked them: “To how many open houses you bring your buyers, when you show properties on Sundays?” The average came to roughly 3.5. 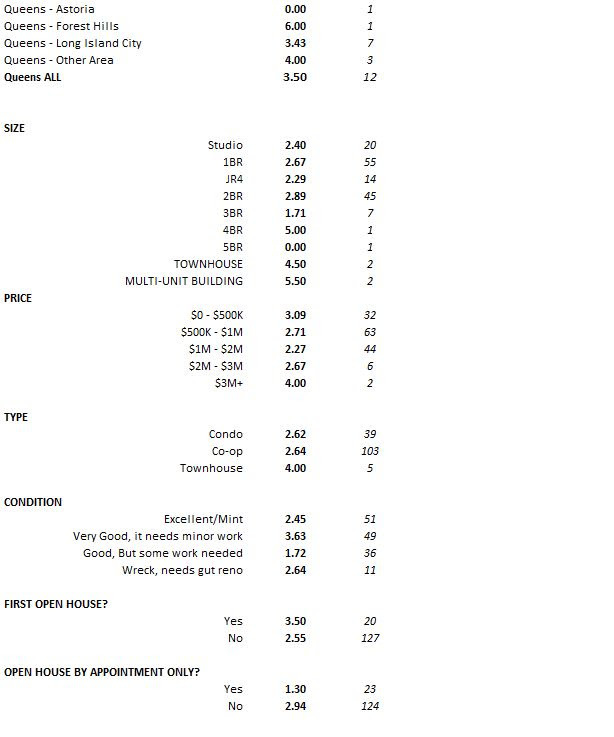 So, assumption was made that average buyer attends between 3 and 4 open houses on each weekend they go out. We know that last Sunday there were 3468 open houses scheduled, which implies there were 9294 open houses visits. If each buyer visited on average 3.5 open houses, it means there were roughly 2655 buyers actively looking last Sunday. Margin of error? Huge! :). Let me know your thoughts of this very crude analysis. Best of luck this coming Sunday! Send me your data and encourage your colleagues to do the same.